A delightful, whipped up body moisturizer, Beneath Your Mask Vegan Heal is a beauty multitasker. 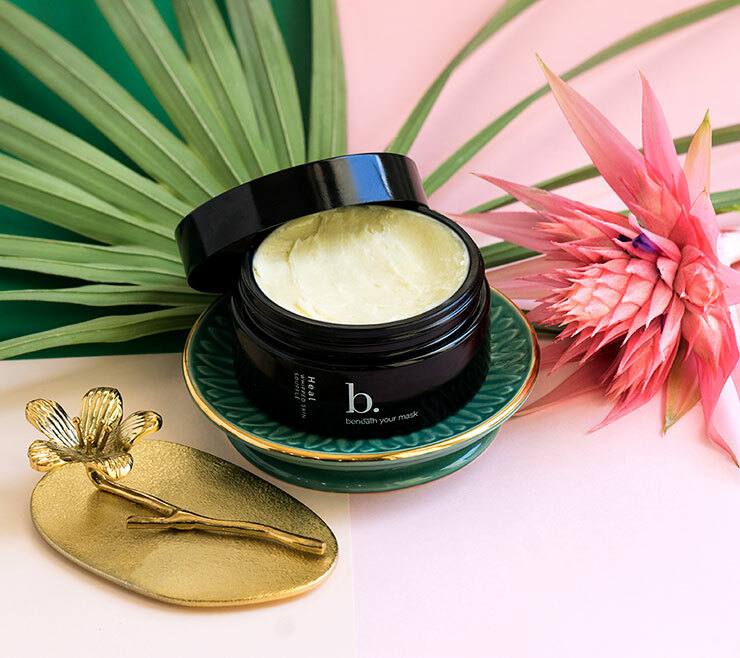 The luxe feel of this skin soufflé glides onto skin and offers a remarkably nourishing sensation. Avocado oil lends the feeling of softness and soothing calm to rough and irritated skin. Jojoba offers a balancing sense, and visibly reduces stretch marks, scars, and imperfections. Lavender and lemongrass promote the appearance of smooth, toned, healthy skin. Use to improve the look of dry, mature, and irritated skin types. Massage skin soufflé onto clean skin after bathing to create a feeling of smooth, soft moisturization. Use daily or more if desired. Butyrospermum Parkii (Shea) Butter,* §Mixed Tocopherols From Non-Gmo Soy Sources (Vitamin E), Vitis Vinifera (Grapeseed) Oil*, Prunus Amygdalus Var. Dulcis (Sweet Almond) Oil*, Persea Americana (Avocado) Oil*, †Simmondsia Chinensis (Golden Jojoba) Oil, Rubus Chamaemorus (Cloudberry) Seed Oil, Cymbopogon Flexuosus (Lemongrass) Essential Oil, Lavandula Angustifolia (Lavender Population) Essential Oil**, Melaleuca Alternifolia (Tea Tree) Essential Oil*. I live in the Chicago area and this Vegan Heal has been such a lifesaver for my skin. The winter weather is so hard on my skin and this product keeps my skin wonderfully moisturized. Usually by the end of the day my legs are really, really dry, but this mousse provides a wonderful barrier against the cold weather. And the lemongrass scent is wonderfully refreshing. Will definitely purchase again.